adds some extra buttons to timeslider. what can be more here ? send some useful sugggestions. forces to increase or decrease rows of shelf. its strongly recommened to remove it.use this instead. Creates a window that moves the pivot point to the last selected vertex position. or rotating around another object’s center. an easier way already included in Maya. Moves pivot point to last selected vertex position. 1.Select vertex of an object. 2.Press the Point Position button. Shows xyz position. 4.Press the Move Pivot button. Pivot moves to new position. //Controls for viewing position of current selection. //to use their precision flag as a round-off function for text labels. //-m/manage flag used for invisibility. //Moves pivot point to same position as last Point Position setting. //Switch to object mode before pressing the Move Pivot button. //Tokenize separates the string into an array. I would like to have a mel which would snap UVs together. I couldn’t not find it anywhere so I decided to post it here and see if someone who knows how to write a Mel could create this to help to make a better world ; ) for those who work with UVs. If I select one UV - in UV Texture Editor window go to Select - Converte selection to Edges - (right the way) Select selection to UVs - like that all the UVs that are related will be selected. From here I think the deal would be to have a command which would save each of the original index # and the original position (U,V). I visualized a FloatSlider where we could control the distance just like “Merge Vertex Options”. Also a right and left arrow which would have the function of select the UVs clockwise. Is it possible or it is just a dream? This is the parent shape trick for selecting a joint by way of a control curve(s). You can also use objects with shape nodes. of text. Is it possible? " Another one: is there a way to set individual spacing for checkboxes in a vertical checkBoxGrp? Dialog box for proportional scaling to a specific size. //Description: Dialog box for proportional scaling. //Proportional button scales x, y, and z values. //Use in object mode. Select an object before opening window. 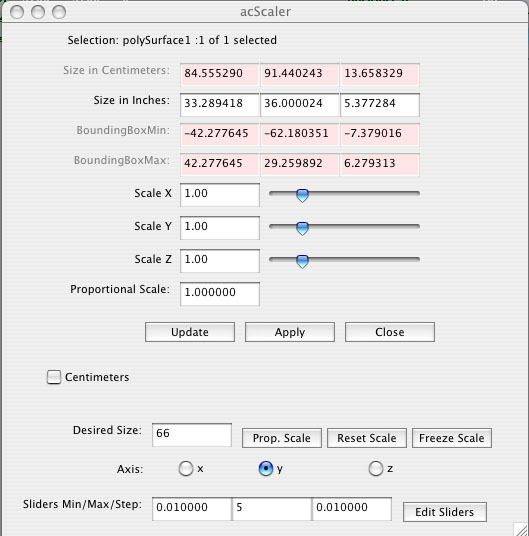 //Proportional Scale changes do not take effect until the Apply button is pressed. //Reset Scale button resets scale to 1.0. Reset before entering a Desired Size. //Freeze button makes the current size the new 1.0 scale. //Check the Centimeters checkbox to scale to desired size in centimeters. //Uncheck the Centimeters checkbox to scale to desired size in inches. //Press the Apply button to apply the scale to the selected object. //The selected object is scaled on the axis selected and the other two axes are scaled proportionately. //Update button shows what is selected in a label at top of the acScaler window. //Press the Update button to verify the current selection. //Edit Sliders button adjusts sliders maximum, minimum, and step values. //Undoing doesn't update bounding box fields. Click the update button after undoing. //Using attachForm with a larger offset centered the upper ColumnLayout better. //The -at flag determines what attributes are affected by sliders. //Layout nested inside another layout. radioButtonGrp -numberOfRadioButtons 3 -columnAlign 1 "left"
-columnWidth 1 60 -columnWidth 2 80 -label "Axis:"
confirmDialog -title "acScaler: Selection Type"
-message "Select a Polygon, Subdiv, or NURBS Object before opening acScaler." //Update sliders when a new selection is made. -message "Select Polygon, Subdiv, or NURBS Object Type." confirmDialog -title "acScaler: Scaling Message"
-message "Size on X axis is 0. Select another axis for desired size." -message "Size on Y axis is 0. Select another axis for desired size." -message "Size on Z axis is 0. Select another axis for desired size." -message "Reset Scale before entering desired size." there’s some script i’ve written foк easier tuning of DOF in Maya. It works both in maya software & mental ray renderers (the only difference that in mental you should decrease Fstop attribute approximately 50 %). this script creates camera and two locators, one of which (the biggest) has attributes DOFdepth (for determining which focus distance you need) and Lscale (for comfort). !dont translate it with moveTool! hi, im looking for a script that allows me to change the color attribute for multiple shaders at one time. or possibly just setting the color attribute to black. i have a big scene with many shaders and im trying to get a reflection pass and i do not want to lose any of my reflection attributes. -t "MAYA_PROJECT_MANAGER ® Scripting by: OPTIK "
-label " Import File "
-l " Local D:/ "
-l " Local C:/ "
-tabLabel $child14 "Maya Help "
i have attached a script that can be used to retain the target shapes even if you alter the base shape. Works on poly. select the base mesh and execute the script, it will prompt for a name of the shape (ex. sad, happt, eyb_blink_left…) , once u enter the name, a shape is created, now just sculpt the shape you want. Now when u alter the base mesh the target also changes accordingly. plz try and let me know if it helped you someway. With that red mark being a PAL 768 (768x576) standard. Can anyone please tell me the script for this, please. With that red mark being a PAL 768 (768x576) standard. Can anyone give me script for this please? I have started compiling all of my scripts into a single area on my website. I wanted to post a link here to provide them to everyone who has already been so generous to me. Some are more useful than others, but I have found them to be big time savers myself. If you find problems with them or would like other features, please let me know and I will see what I can do. I am going to be updating the site regularly, so if you want to subscribe to the RSS you will get automatic updates as to when new scripts come available.